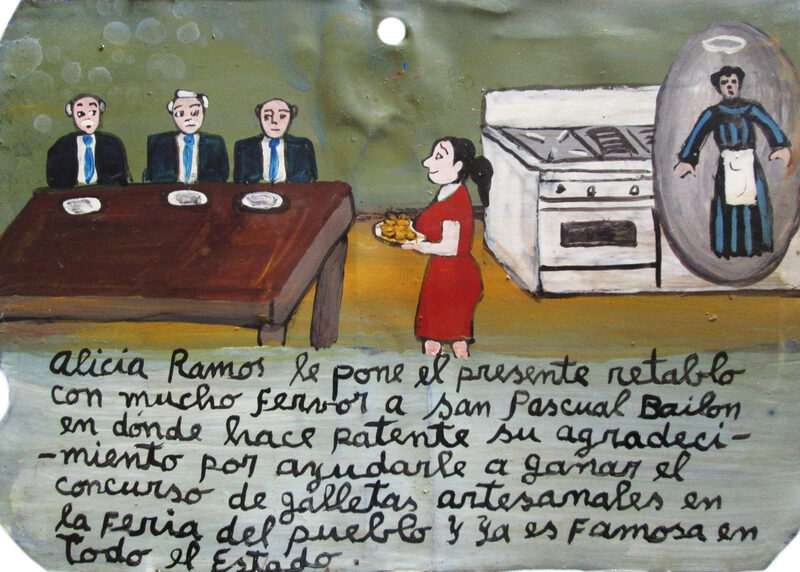 Alicia Ramos brings the present retablo to Saint Paschal Baylon and thanks him for helping her to win the traditional cookies contest at the town day. Now she’s famous all over the state. 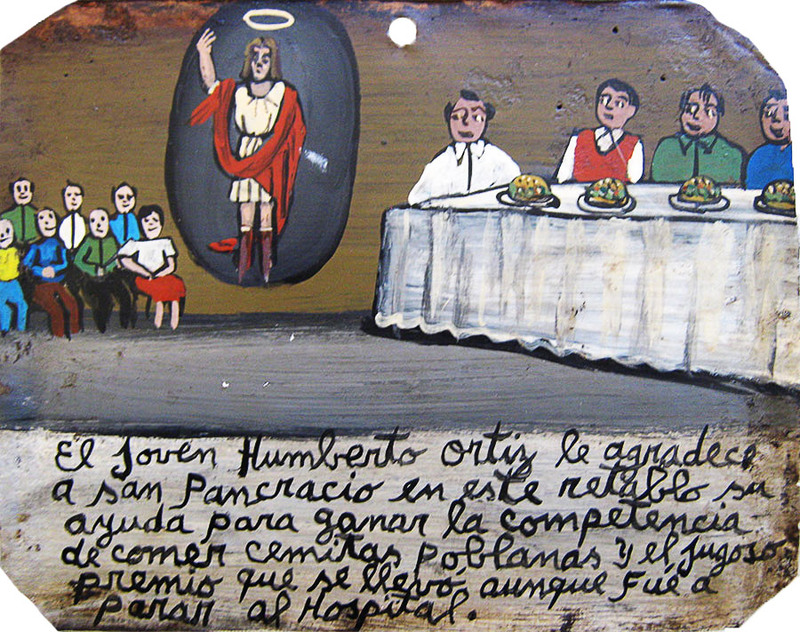 The young man Humberto Ortiz thanks Saint Pancras with this retablo for helping him to win the hamburger eating contest. He received a delicious price, although he got in the hospital after the contest. 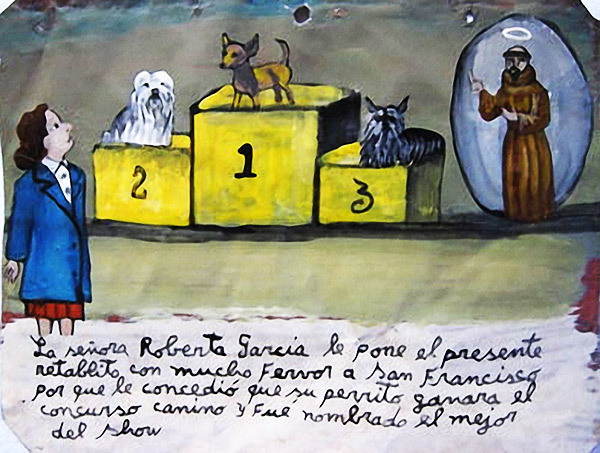 I dedicate this retablo to Saint Pacras because with his help I could find a costume which I think is from Russia. 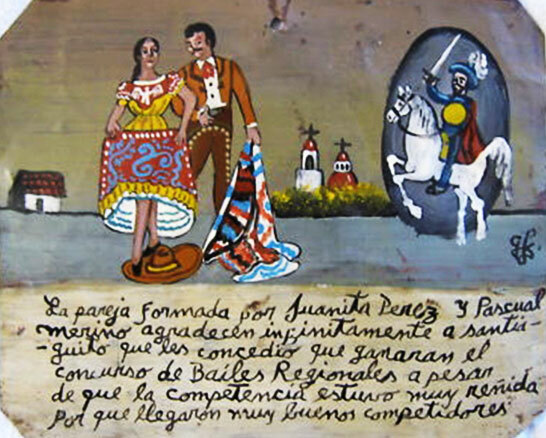 With this costume, I won the first prize at the holiday party in honor of the patroness of Queretaro. 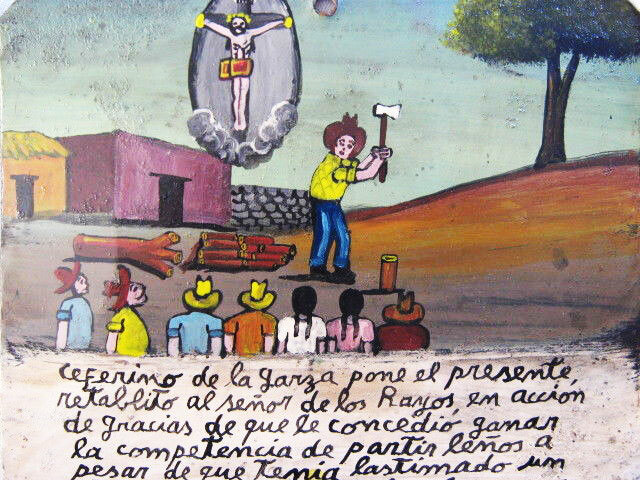 Ceferino de la Garza brings the present retablo to the Lord of the Lightnings because he won the wood chop contest, although did injure his arm a bit. 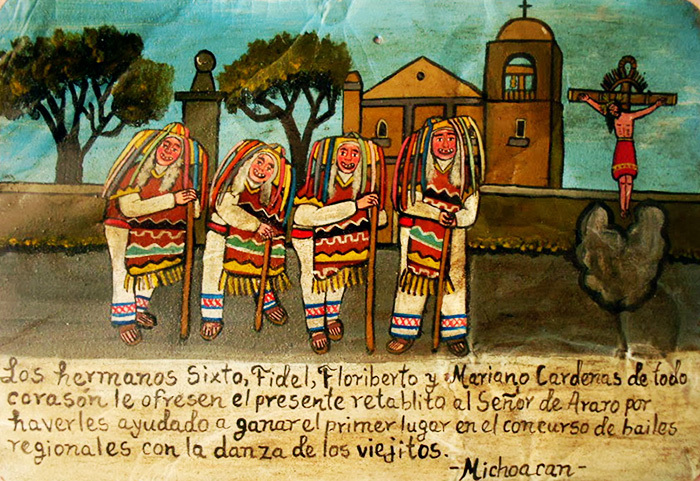 The Cardenas brothers, Sixto, Fidel, Floriberto and Mariano, wholeheartedly offer this retablo to the Lord of Araro for helping them to win the first place at the regional dances contest wit their Oldman dance. 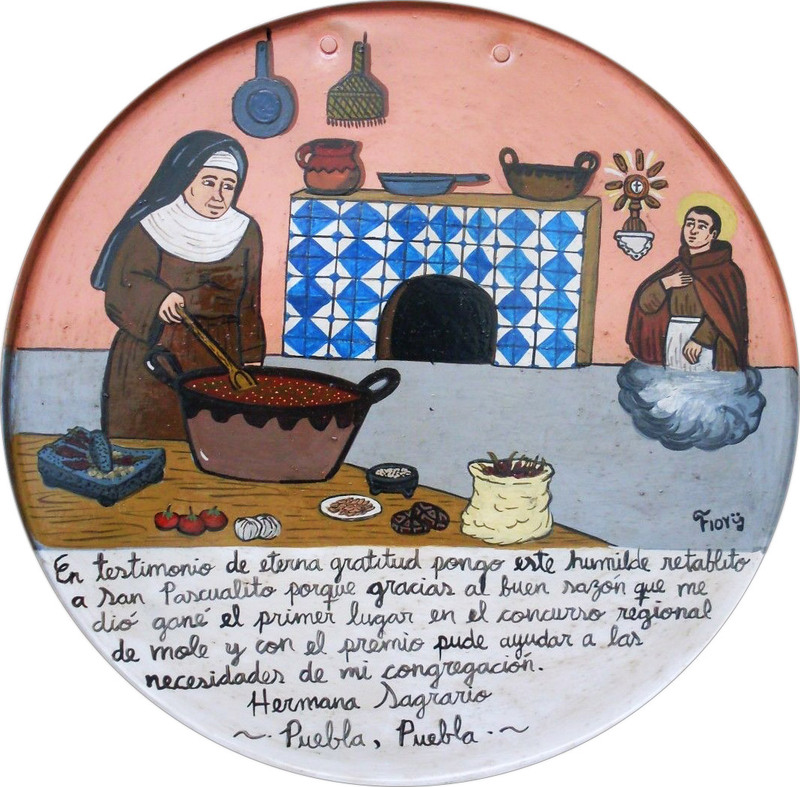 I bring this humble retablo to Saint Paschal as a testimony of my eternal gratitude because he gives good taste to my dishes, and thanks to that I won the first place at the regional mole contest. I use the prize for the needs of my congregation. 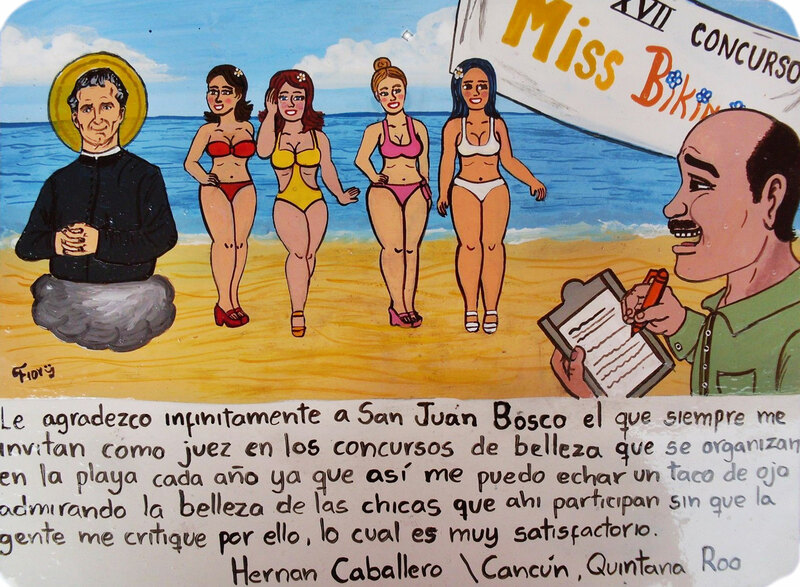 I’m infinitely grateful to Saint John Bosco because very year they invite me to the annual beach beauty contest as a judge. Here I can look over and admire the beautiful girls without being criticized for it by people. This is what I like. 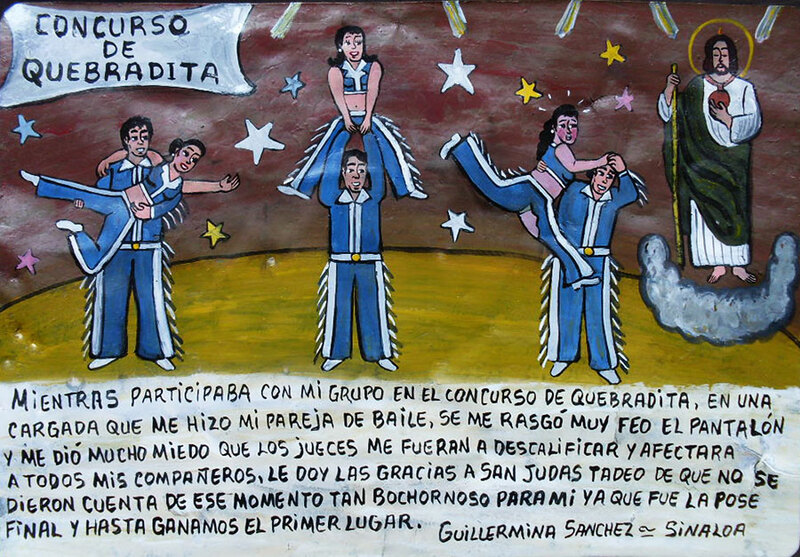 The couple of Juanita Perez and Pascual Merino thank Saint James for winning the regnal dancing contest despite the competition was very hard and other couples were really good. 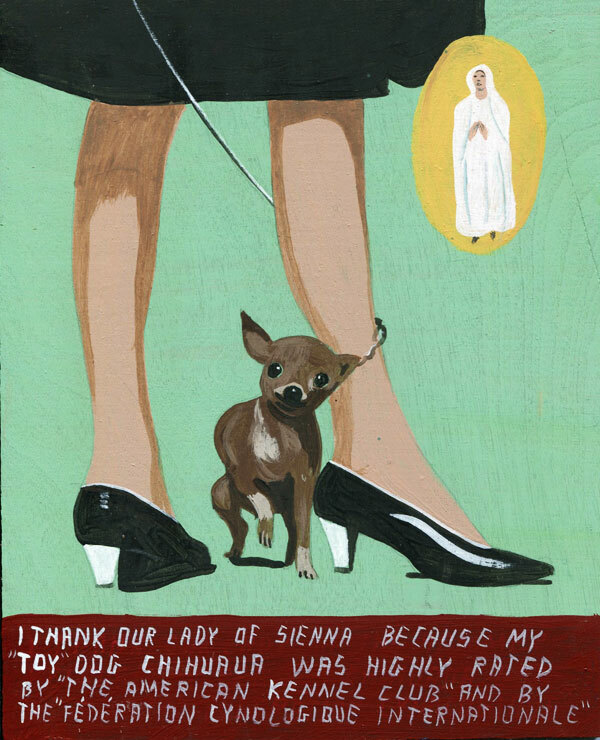 I thank Our Lady of Sienna because my toy dog chihuahua was highly rated by “The American Kennel Club” and by the “Federation Cynologique Internationale”. Carmelo Contreras decided to participate in the town day contest. 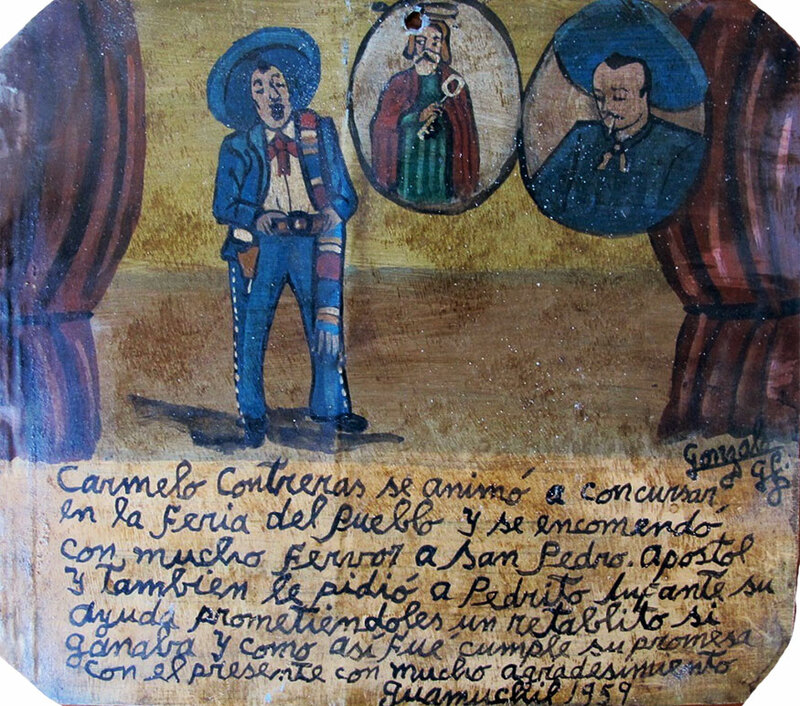 He entrusted himself to Saint Peter the Apostle and also asked Pedrito Infante for help promising to offer a retablo after the victory. 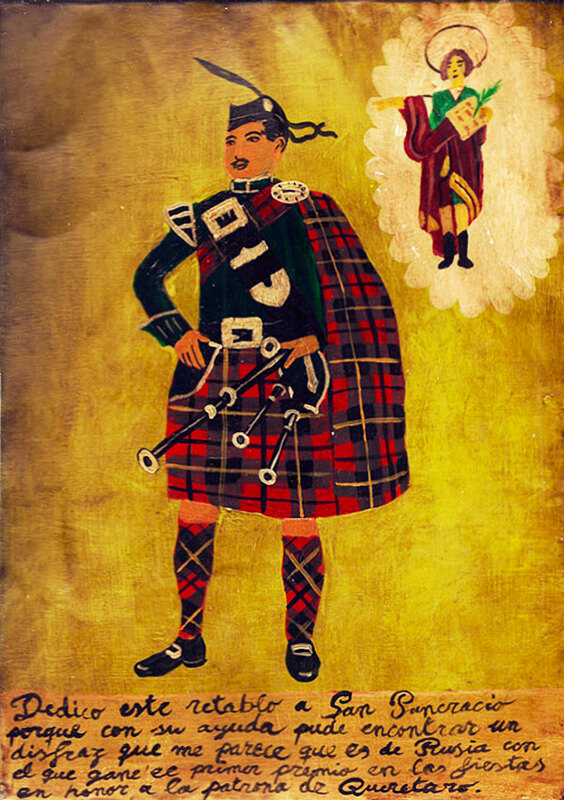 His dream came true and he fulfills his promise. 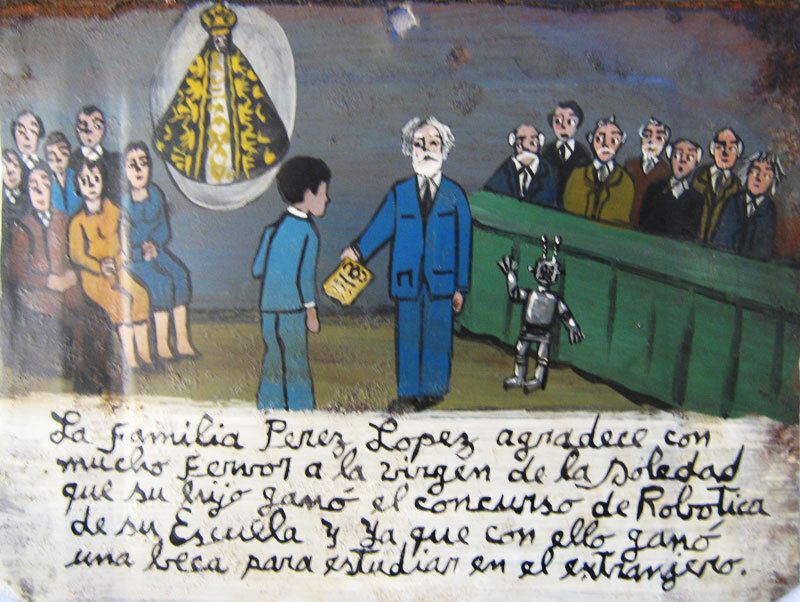 The Perez Lopez family thanks the Virgin of the Solitude because their son won the robotics contest in his school and received a grant for studying abroad.